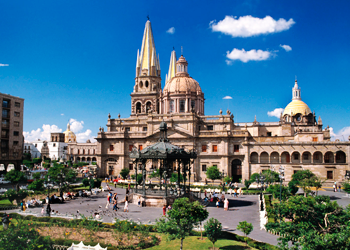 Guadalajara is Mexico’s second biggest city and in many respects can be considered the cultural center of Mexico, or the quintessential Mexican destination. This is the birthplace of mariachi music and tequila and host to a number of large-scale cultural events such as the International Film Festival of Guadalajara and the Guadalajara International Book Fair and a number of globally renowned cultural events which draw international crowds. It is also home to the C.D. Guadalajara, one of the most popular football clubs in Mexico. This city was named the American Capital of Culture for 2005. Whether you choose to explore the city by foot, double decker bus or calandria (horse-drawn carriage), you’ll find that Guadalajara’s numerous plazas, colonial architecture and modern conveniences make this a delightful city to visit. 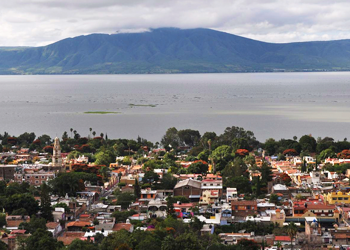 Lake Chapala and its surroundings is one of the most charming places in the world to spend a great retirement. A place where natural beauty, tranquility and beautiful weather all year round, are just some of the attractions. This destination in the state of Jalisco is the largest water reservoir in Mexico and provides for the drinking needs for much of the city of Guadalajara. Here, a variety of cultures and nationalities come together, resulting in an exotic blend that coexists in a typically Mexican environment. The bounty of the local food is a great advantage for foreigners living here, because there is a great variety of food, it is plentiful and available all year. Chapala is located just one hour from Guadalajara. From Chapala you can easily travel by car to San Miguel de Allende, Cuernavaca, Puerto Vallarta, Zacatecas, Patzcuaro, Manzanillo, Morelia and Mexico City. The name derives from Nahuatl and means “place above clay land”. The area is famous for its pottery and blown glass. 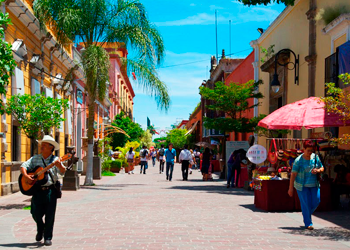 Tlaquepaque features El Parián, a large plaza built in 1878 and flanked by columned arcades and surrounded by restaurants and bars. The main square in the city centre is known as El Jardín Hidalgo (“Hidalgo Garden”), named after Miguel Hidalgo y Costilla, the “Father of Mexican Independence.” A larger-than-life statue of Hidalgo dominates the square. Other main features include the two important churches, El Santuario de Nuestra Señora de la Soledad (The Sanctuary of Our Lady of Solitude) and San Pedro (Saint Peter), and the Benito Juárez market.